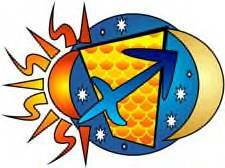 The first Solar Eclipse for the New Year of 2010 is happening on January 14th at 11:13 p.m. PST at 26th degree of Capricorn, is pointing to a major crossroad which spotlights our method of our operations, the structure of our thinking and values that need to be transformed or eliminated. With the eclipse making a sextile to Uranus and Mercury conjunct Pluto, square Saturn, it is telling us, to think out of the box to discover new ideas and solutions. To identify the issues and problems and work on the solutions, rather then allowing things to continue as they have been, or a quick fix to the situation which does not eliminate the problem. Jupiter is about to shortly move into Pisces representing spiritual realities, intuition, imagination, the arts, meditation, and occult and metaphysical studies. Jupiter is also concerned with the truth, wisdom, the law, tolerance, reconciliation, and appreciation and enjoyment of life itself. “The Sabian symbol for the Moon at 26th degree Capricorn is taken from “The Sabian Symbols in Astrology by Marc Edmund Jones”, and what follows are my comments. Capricorn 26 A Water Sprite This is a symbol of a pure mastery of experience in its inner or spiritual aspect, and of the possession of every richness of outer reality in a highly imaginative or personal form. Here the pure integrity of self asserts itself as a protection against blind or inept participation in the current course of events, and calls for a conscious self-idealization in even the most unimportant or transient functions of life. Spontaneity is demanded as a necessary quickening to values. The keyword is restlessness. When positive, the degree is an exceptional sensitiveness to over-all implications and high skill in avoiding drab or commonplace involvements, and when negative, carefree irresponsibility and a dislike of intimacies. This is explaining to us that we need to be like the nature spirits and experience and feel through the fullest, what life has to offer. That our sense of sight, smell, hearing, touch and taste does not miss any sensation or situation that comes our way, and that through really experiencing every moment, then can we make the right decisions. The word restlessness is a little deceptive, in that it is implying boredom which may be involved, but restlessness that causes us to want to experience the moment and to ever develop new skills to avoid doing things routinely, has no alliance with boredom. In this fast paced world the Universe is telling us to slow down and smell the roses. Until we can do that we cannot make the right decisions for the future, as we do not have all the facts in front of us. The planets are trying to direct us towards a better future by helping us to become aware of our surroundings and environment by being attuned and connected with all that God has created. This Solar Eclipse is asking us to go into our inner holy place and unveil our highest and noblest aspirations for the future and bring it into reality. One of the first rules one learns in delineating a natal chart is that the Sun, Moon and the Ascendant helps decipher the personality of the person in question. That doesn’t mean that the other planets don’t help color the character, but if one wanted to get a general first opinion, one looks at these three points, first. Many times I have heard people tell me that the Sun sign doesn’t seem to fit and wonder if astrology has any truth to it. I always try to explain that our personalities are quite complex and that in reading a chart, all the planets need to be considered and analyzed in relationship to each other. The Sun gives us the essence or intrinsic character of the person, central concerns, symbolizes the paths and goals, masculine elements, vital and dynamic energy, self-realization, and what is most essential to the individual. The Moon represents our inner nature, the feelings and emotions, the unconscious, the instinctive reactions, feminine aspects, security, way of life, and the nurturing and caring of the unit as a whole. The Ascendant is that part of our character we allow others to see, not necessarily who we really are. How much of the real person is exposed to others depends on the aspects of the planets and how the individual has dealt with life’s complexities and is willing to be vulnerable and comfortable in his surroundings. Even after understanding these three in relationship with each other, how they react with each other is quite important, in understanding the motives and actions of the individual. What are the major signs, and in what elements and how many active planets? Are the three planets in signs they feel comfortable in? Are all the planets on one side of the chart, or are they evenly distributed? So many things need to be considered before one can rattle off an opinion. The one thing I have regretted in the age of computers is having the time to compute the chart by hand, and not the quick world of the personal computer. The laborious method of computing a chart by hand, let’s us see details and aspects that might easily be missed, otherwise, and may be a major point in the delineation and the understanding of the individual and his actions. The planets in the first house are also very important in working out the character, as they will color the way the Sun and Moon would react to any situation. 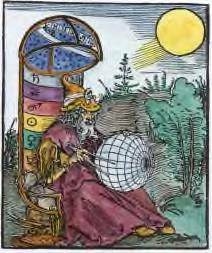 How does the planets in the first house aspects the other planets, especially the Sun and the Moon will be a telltale sign of the individual. 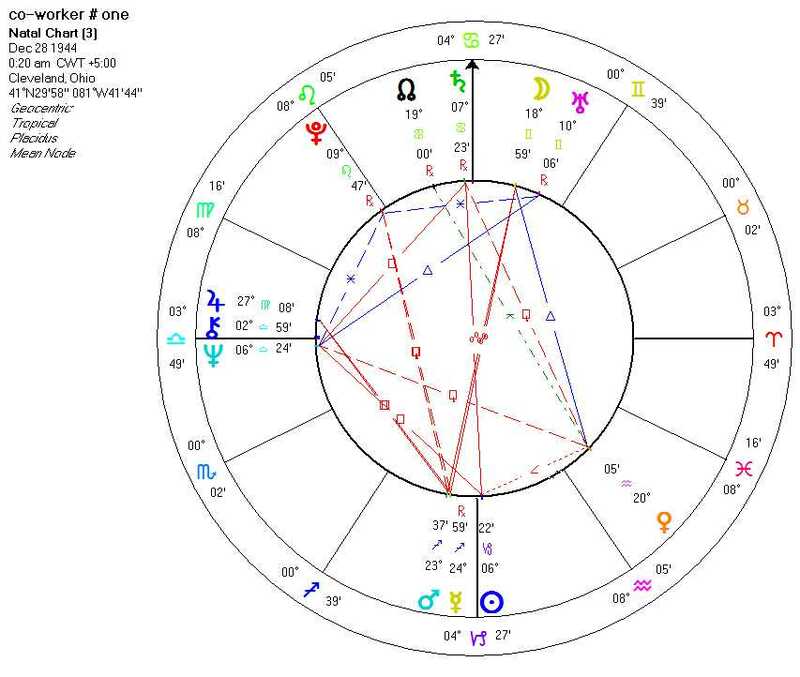 Another aspect that we sometimes forget to think about when analyzing a chart is the ruler of the first in aspects to the Sun and the Moon, and to any planets in this house. The subtle influence the ruler of the first tends to be unnoticed at first, until one really begins to analyze the situation. I have Neptune in the first, trine my ruler, Mercury in the ninth house which always colors how I think of anything and how I express my opinions to others. With Neptune in the first I can express it with how I clothe myself and my actions, but it comes out through my thoughts on things that are close to my heart. It is very subtle, but that variation can be the difference to a hum drum existence or to the success one has desired for oneself. Also that difference can make a delineation of a chart to be a turning point for the individual, by giving the individual extra clues to make a difference in his life. I definitely believe that the ruler of the first house gives hidden pizzazz and suggestions to our personality which will help us to a rewarding and successful life in this world. The other day at work I was relating to a fellow co-worker that in my traditional astrology yahoo group was having a discussion on William Lilly’s book “Christian Astrology”, that Saturn Retrograde in a natal chart usually means problems with the father or an authority figure. 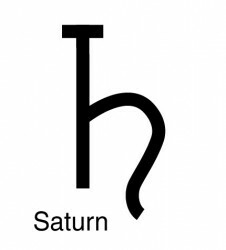 Saturn Retrograde also means having trouble with too much or too little structure, too much or too little authority, too much or too little rules and regulations. I noticed a glint in her eye, and I decided to look at her chart to see if there were any retrograde planets, especially Saturn. Bingo, four planets were in retrograde and Saturn near the mid heaven, three degrees from the angle in opposition to her Sun by one degree. As she was growing up, the opposition made the relationship with her father, difficult if not, down right hard to deal with. Mercury Retrograde indicated that she trusted her instincts first, and then relied on her emotions and then how she thought about the situation through her intellect. Mercury Retrograde also indicates an unusual relationship with her siblings. I couldn’t wait to get back to work to see if my findings were confirmed. It is always exciting to me to find rules in astrology that are no longer practiced in today’s world, but still is true in this day and age. Saturn in opposition to her Sun would make her life difficult, and not having a father figure she could look up to and respect, would color her life forever. Any one in this situation would be continuingly looking for a father substitute in love, friends and business relationships. She would also be attracted to people older then herself as they represent authority and can give the approval that was missing from the home environment, as expressed with the opposition in the fourth house of the home. This aspect not only makes her yearn for praise and approval, but also makes her give praise and approval. It would also color her work situation; making her always doing her very best and helping others do their very best. The need to be able to respect the decisions and actions from those above her to those below her in the work environment is also indicated by the aspects. One of her main mantras expressed by Sun square Neptune and Chiron “You don’t need to know what you want or need, but you do need to know for certain, what you don’t want!” Isn’t that the truth! What I find interesting in this chart, is that if the retrogrades are experienced in childhood as good or difficult, they will color the whole chart and the whole life of the individual. Depending how the individual copes with the difficulties and if he or she sees these problems as an impetus for growth, then the difficulties becomes stepping stones to their success. Whether the aspects are exaggerated to the extremes are not, these planets tend to show all sides, and vice versa as the need becomes apparent. Unlike the planets that are straight forward and do not diverge from their purpose and intention, the retrograde planet in the natal chart tends to become versatile and adapt to any situation. Although a retrograde planet may be considered more malefic in a natal, as it has been handicapped by retrograding, I believe they are similar to the malefic aspects of squares and oppositions. They are actually not as malefic, if you understand them and know how to use them to your advantage. My mantra is “There is nothing that is benefic or malefic; it is what you do with them that will either harm you or benefit you”. Finally I do think that Saturn Retrograde does mean an absentee Father figure gone astray, but how we use these retrogrades will depend how successful and happy we will be in life. As we are quickly approaching to the end of another year, and the beginning of a new one, I began wondering what this Mars Retrograde in Leo again happening around the Winter Solstice, which normally extends to about six weeks to an unusual length of almost eight months in Leo, means in our daily lives for the coming year. My astrology group has been discussing Saturn Retrograde and it’s meaning in the natal chart and how it may show the absence of the father figure or beneficial guidance or mentoring. I began wondering what Mars Retrograde would indicate in a natal chart and as a transit to us individually, and as a collective whole. The Mars Retrograde will square my Sun, so I have decided to think more deeply on the matter, and what I can do to make it benefit me more, then it normally might have done. Thinking that Mars would react like Mercury Retrograde, but not as noticeable to the general public, I am determined to be careful and cautious of the actions of this red planet. Mars in principle means strength of will, desire to conquer and conquest, perseverance and stamina, aggression and passion, and the ability to actualize and accomplish one’s objectives. Being retrograde these actions tend to come into reality more carelessly and without forethought. With retrograde we don’t need an excuse to cause problems, as we jump into action before understanding the situation. We tend to appear to be quick tempered and far too quick to act in any situation and our anger is unreasonable. Our actions may be full speed ahead, but nothing is apparently accomplished. Our nature may be normally docile and gentle, but a violent streak might appear unexpectedly. With the planets still indicating a difficult period ahead of us, we need to be vigilant with our actions and with Mercury Retrograde, the need to look with care before deciding on what actions we need to take. Mars Retrograde in a natal chart may point towards a need to understand aggression, action and passion and how to use it, as a benefit in one’s life. What we saw in our childhood, how we understood it and how we incorporate it in our thinking, is how the retrograde affects us now. Our ability to harness the Mars energy and to use it to our benefit, will determine how successful we become in this life. Mars the god of war anticipated all situations before going into battle, and in reality was using the talents of Mercury to keep ahead of his enemies. Retrograde planets in the natal may also indicate that the blessings will come later in the person’s life, or that the person uses that energy in a different way. 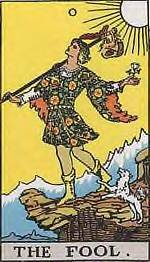 With Mercury and Mars doing their thing, our main mantra for the coming year should be like the Fool Card in the tarot “So look before you leap”. How successful we will be in the coming years will depend on our foresight, our understanding of the nature of retrograde planets and our ability to use Mar’s and Mercury’s energy to fulfill our convictions, hopes and desires. If in the last year, we weren’t persuaded that the Universe was trying to tell us that we needed to make some drastic changes and that we can no longer continue the way we have been going. New Year’s Eve night is coming in with the biggest bang ever to convince us, as the last SuperMoon of 2009, where the Moon is at both perigee (closest to the Earth) and syzygy (in line with Sun and Earth). This Full Moon is also a lunar eclipse, an even more precise alignment of the Sun, Moon and Earth which will intensify the gravitational pull, generating higher tides. As above, so below our own body fluids will be subtlety affected, making us aware that we also are driven by the same forces that affects the earth. With the Full Moon in Cancer, it is telling us, that we need to release what is no longer serving our growth and desires, and that we are required to surround ourselves with things which will nurture and nourish us. We need to go within into the realm of the intuition and our instincts to bring out from the unconscious and subconscious the developments of feelings, fantasies and creative imaginations which will feed our souls and continue our growth. The Moon facing the North Node, Mercury, Sun, Venus and Pluto in Capricorn is directing us to the realization that by nurturing ourselves, we are then capable of nurturing others for the greater good of us all. The aspects of the planets are telling us to think outside of the box, and to realize that business as usual is no longer applicable. The financial meltdown has shown us that the accountability of allowing others to keep us safe has not worked, and the responsibility has to end up with each of us being aware of what is happening. It is also telling us that we need to act or react to our surroundings, that we can no longer allow things to go on as they have been, because it is safe or that we think it is. “The Sabian symbol for the Moon in 11 degrees of Cancer and for the Sun in 11 degrees of Capricorn is taken from “The Sabian Symbols in Astrology by Marc Edmund Jones”, and what follows are my comments. Cancer 11 A clown making grimaces This is a symbol of the continual self-rehearsal by which the everyday personality of man is able to sustain its particular characteristics, and of the tentative side of experience through which the uncertainties of life can be dramatized for acceptance or rejection without incurring any penalties. Here is an emphasis on the ridiculous as an instructive exaggeration of human nature, or as an exhibition of its inadequacies in a direct simulation to better self-realizations. The keyword is inimitability. When positive, the degree is effective sharpening of an individual’s dominant or everyday impact on others, and when negative, a loss of personal influence through aimless self-exploitation. Capricorn 11 A large group of pheasants This is a symbol of the social ritualization by which man’s everyday personality is able to maintain and refine its particular characteristics, and of the common expression of self through which life endows each individual with his fundamental inner certainty and his convenient outer reality. Here is an emphasis on the reduplication and multiplications of every facet of existence, so that the continuous variations come to dramatize an infinite potential inherent in the whole. The keyword is illimitability. When positive, the degree is a tireless pursuit of every personal aspiration, and when negative, egotistic satisfaction in matching the mediocrity of others. Change is in the air, so let us not copy or imitate what has gone before, but to go within and bring forth new innovative ideas that will continue our progress. By going to the dark side we will see the light at the end of the tunnel. Only by experiencing what we don’t want, can we decide what we do want and desire. 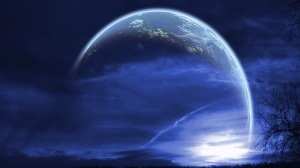 So with this in mind, the steps we take with this Lunar Eclipse will bring us a happier New Year. As the tradition continues, what we do or think on New Year’s Eve is what will carry on through the whole year, so aim high and follow your dreams and create your own happiness and peace for the future with the energies produced by this lunar eclipse. As the dark winter months roll in, our thoughts and actions turns further inward as we approach the winter solstice and the Holidays, and our biggest surprise we receive after Christmas Day under the tree, is Mercury Retrograde on December 26th 2009 at 22 degrees Capricorn. As one who has always been cautious of Mercury Retrograde and will give it the respect it deserves, I realized, it is an important time to go inward and to reflect and pay attention to our thoughts and actions. A Retrograde period is when retrospection is a necessity to avoid glitches, personal misunderstanding, flawed, disrupted, and delayed communications with ourselves and others. Although I know there will be delays and disruptions we can not avoid during this period, I do believe much of the frustrations and stress we experience is sometimes caused by our own carelessness in our thinking and action. It is our assumption, that others understand our speech and intentions that causes the delays and frustrations we experience at this time. It is also our mistake, that what we think we are communicating to others, is what they comprehend. If we become clear to ourselves of the situation, then both our speech and action will express to others of our intent. Capricorn 22 A general accepting defeat gracefully This is a symbol of the immediate opportunism by which the human will develops its real power, and of its underlying and uncompromising loyalty to the long-range ends in view. A realistic practicality is made effective through a self-disciplined grace of spirit, so that men are won over very often by the enemy they have defeated. The individual exalts his destiny as he finds its roots established in a values accepted by his fellows, as well as himself. The keyword is expediency. When positive, the degree is a genius for learning from experience and transforming setback into accomplishment, and when negative, irresponsible acceptance of the worst and insensibility to self-inadequacy. With Mercury Retrograde in Capricorn, how others see us and how we appear to others is of our main objective, and the need to have the respect and loyalty from them is upmost in importance. Our need to be clear of our intentions and how we communicate it can decide how well we can create the trust of others, to follow our lead. Whether it is to impress our own family and friends or those we work with, being careful of our decisions and how we carry them out will make a big difference in the respect and admiration we will receive, and need at this time. And if one has made a mistake, instead of blaming others, take on the mantle of responsibility, and accept the situation and immediately change your direction to correct the problem. One might not win, but one will win the respect of others to one’s honesty and integrity in this particular situation, especially during this retrograde period. The New Moon period has become my favorite period of the month as it brings my thoughts back to what I desire in life and is the time of the month, where one can create and bring into manifestation one’s hopes and wishes for the future. Especially during this particular New Moon at 25 degrees Sagittarius on December 16th 2009 where there are no planets in retrograde, which means the air is clear to focus on what is needed to bring satisfaction and happiness into our lives. In our fast paced life in cyberspace we need to work with the Universe when it gives us a period of time, when it is working with us and not against us. With the New Moon in Sagittarius, it is asking us to dig deep and wide into our consciousness and the subconscious, to grasp the big picture and attune ourselves to higher and loftier goals for the future. As the New Moon is on the verge of moving into Capricorn, it is telling us that we need to reach for a more spiritual and loftier ambition for the welfare of humanity. When the planets are in retrograde, static and carelessness is the air, and the ability to focus on what is important at the moment is not so easy. So I advise one to go within at this time, where there are no disturbances and decide what is really important that will make the difference in your life in the future. “The Sabian symbol for the 25th degree of Sagittarius is taken from “The Sabian Symbols in Astrology by Marc Edmund Jones”, and what follows are my comments. My emphasis in the last few months has been to express the need to search within oneself to discover our true needs for happiness. As I feel the transits of the planets are suggesting major changes in this world at this time, we need to be ready with a new direction, so we won’t be left behind when the time comes. Our need to feel we have a purpose and are performing well at what we have chosen, will give us the confidence to further accomplish more then the original vision and wish. The confidence in ourselves also will allow us to take more chances, and bring them into manifestation. This New Moon in Sagittarius is allowing us to be in touch with the Divine Spirit through our intuition and moments of inspiration, which will be a great help and comfort to us. So take notice, and fill up your blank slate with the thoughts, ideas and actions that will inspire you to achieve your happiness.